Deb Goldberg pictured in her State House office. 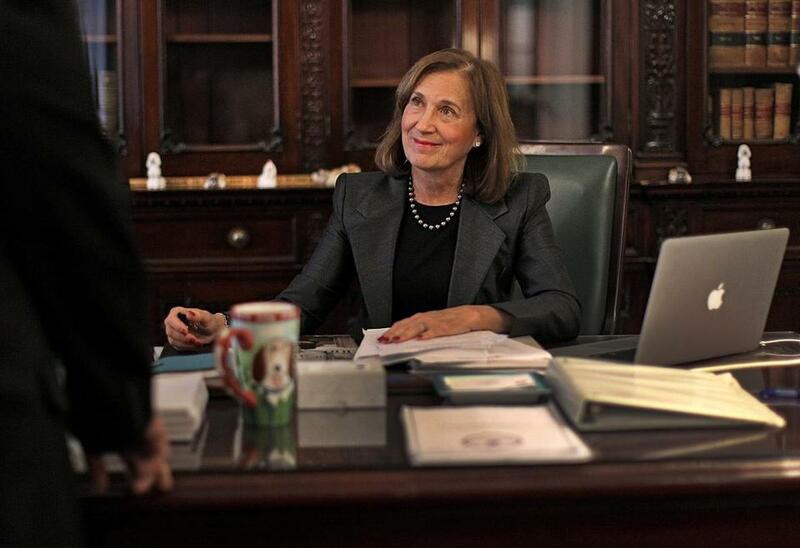 Deb Goldberg didn’t break any state ethics laws when she took it upon herself, while state treasurer-elect, to call a job applicant employed by a nonprofit whose board she serves on to pressure the applicant into telling her current boss about her job search. But it was intrusive and inappropriate, and at the very least the Legislature should take it upon themselves to clarify that the same ethics rules that apply to elected officials also apply while they are transitioning into government. Hannah Fisher began working as an adoptions coordinator for the Newton-based nonprofit Adoptions With Love last May, and shortly after last year’s election she decided to apply for a new job in the State Treasurer’s legal office. Goldberg serves as president of Adoptions With Love’s board. According to Goldberg, the office of outgoing state Treasurer Steve Grossman alerted her to Fisher’s application. Goldberg called Fisher on the Monday before Thanksgiving to tell her she should inform Adoptions With Love that she was looking for a new job and, if she didn’t do so by Jan. 1, Goldberg would do it for her. According to the Globe’s Frank Phillips, Fisher said the tone of Goldberg’s call was “punitive,” and left her “shocked” and “distressed.” Reportedly, Fisher was told by her employer that the charity would begin looking fer her replacement in January. Her last day on the job was Friday, and she is now unemployed. Goldberg disputes the assertion that the phone call was aggressive, and she stresses that the position Fisher applied for in state government has yet to be filled. She says Fisher is still being considered for that role. Goldberg also says the only communication she had with either Fisher or Adoptions With Love about the issue was that initial call, and that she was merely trying to give Fisher advice. “I wanted to empower her to empower herself,” says Goldberg. Both the tone of the conversation and Goldberg’s assertion that she was passed the information by Grossman’s office are beside the point. The fact remains that Goldberg used information she had access to as the incoming state treasurer to interpose herself in the job application of someone who works for her nonprofit. Although her actions were legal, they don’t pass the smell test. The ethics commission has ruled that Goldberg’s conduct was not a breach of ethics because she was not a state employee at the time of the phone call. Given the fact that incoming constitutional officers have access to sensitive state information while they are transitioning to government, that standard is insufficient. The state Legislature should amend the law so that ethical standards about the use of information are enforced as soon as a candidate is elected. Even that change might not have clarified the situation Fisher found herself in. But it would send a message to all government officials, whether sitting or in transition, that sensitive state information such as job applications should be treated with respect.